20 Questions plus a Million! Disclosure: This post is more for documentation purposes and will be more of a grandparent read since the grandparents share in our excitement over the moderately funny things that our kids say, agreeing with us that they are really funny.. While I know deep down in my heart that I'm missing an opportunity to write a super funny post, I'm not sure my exhausted brain can recall the facts much less write them down all snazzy for you. It has been fun and totally exhausting to have the girls together ALL DAY, ALL SUMMER... If it wasn't exhausting enough, with Chloe being the energizer bunny on crack, the questions are enough to drive anyone insane. And every day, I start the day determined to answer the questions and usually break down around question number 343. We were on our way home from the store a while ago and I watched the clock for five minutes and I kid you not, I stopped counting at 50 questions. The car conversations are the best since we all are confined to one spot and I can't get away from them. Emma: (as we're passing a cemetery) "Mom, what is an synonym for cemetery"? Me: Well, Emma I guess that would be a graveyard. Emma: Well, what is an antonym for a cemetery? Me: I don't know Emma, that's not exactly a good question. Emma: Mrs. insert well meaning teacher's name here says that the only bad question is the one that is not asked. Me: Well obviously, Mrs. insert well meaning teacher's name here does not have a 3 year old and a 7 old. Chloe, also taking a cue from her daddy, asks random questions. Chloe: Mom, where is Nonna? Me: Pawpaw is in Alabama..
Me: ALABAMA!!! EVERYONE IS IN ALABAMA!!! EVERYONE YOU'VE EVER MET IS IN ALABAMA!!!! Chloe: (with more attitude than a three year old should have) Well, where's daddy? Emma: Why do you think those people are in the cemetery? Me: I don't know Emma, various reasons I assume. Emma: But why do you THINK they are there? Me: BECAUSE THEIR CHILDREN PUT THEM THERE. Chloe: Mom, are you my mom? Me: No Chloe, I'm not your mom but every time I call your mom to tell her to come get you, she hangs up on me. Chloe: Oh, well what is that store behind your sunglasses? Chloe: WHAT IS THAT STORE BEHIND YOUR SUNGLASSES? Me: (with a tone of realization) That's a reflection, Chloe. Emma: Mom, what is an antonym for reflection? Me: I think we should listen to the radio..
Me: Well we're almost home and you know what cures boredom? Emma: Sleep is boring too. Me: Not if you have a good imagination. Emma: I don't have a good imagination anymore. You have a better imagination when you're young. Me: I'm putting that on facebook. Emma: DON'T PUT IT ON FACEBOOK!! Chloe: (fake belly laugh) I'm putting that on facebook. Emma: YOU DON'T EVEN HAVE A FACEBOOK PAGE. Chloe: WELL I DO NOW! (as the Today Show is posting all the Smuckers people older than 100 having birthdays". Emma: (astonished that people can live to be that old). Did you see all those people that were over 100!? Chloe: Yeah, and they were UGH-I-LEE. Me: (after turning head to laugh) Chloe, it's not nice to call people ugly. Chloe: But they really were ugly. Me: Well it's still not nice. Besides, you're going to be an old person one day too..
Chloe: (laughing and pointing at Emma and Adam) and so will Emma and so will daddy! We need something stronger than coffee at breakfast these days..
Today's my niece's second birthday! 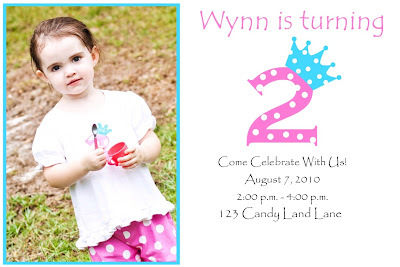 Here's her Birthday Party Invite that I made to match the birthday outfit Jan made her. I think we made a pretty good team on this one. Except it looks better when you can see where the edges of the card are. Anyway, Happy Birthday Sweet Girl! We love you!